Most of the time, a modern vehicle will come with the basics: a car jack and a spare tire, and possibly even an emergency tire patch and inflator kit. That’s good enough for a flat tire, but if your problems are beyond that scope the basics aren’t going to cut it. 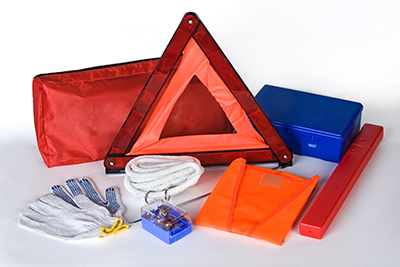 The good thing is, most items for a good emergency kit are things you already have lying around the house, and it’s easy to just load them up into a small gym bag or similar and stick it in the trunk. Here’s the one thing you should have 100% of the time. Granted, most people already have one on their phone — but we think your phone battery is best saved for calling for help! A flashlight is useful to signal for help and allow you to change your tires in the dark. If you really need to, it’ll light your way while you walk back to civilization (though that should be a last resort). Extra batteries are also a must, just in case the ones in the flashlight itself discharge from disuse. If you’ve broken down on the highway, you need some method of signaling to passing vehicles. Warning oncoming drivers is vitally important to prevent any additional accidents and may save your life. We’re surprised by how many people neglect to have one of these around at all times. It’s cheap and almost everything in it is nonperishable, so there’s no reason to skimp on it. Band aids, antiseptic wipes, gauze pads, adhesive tape, and blunt-end scissors are the bare minimum. We like to keep sunscreen and insect repellent in ours as well, just in case. You can never have too much warmth! A couple of blankets may save your life if you’re forced to spend the night in your car. The hats are for daytime if it’s too hot, while the socks are absolutely vital in the cold. Ask any World War 2 vet and they’ll tell you — keeping your feet dry in the winter is more important than anything else. In case you have battery troubles, these will be vital if any passers-by are willing to help you out. Lugging a new battery from the nearest gas station isn’t something that’s fun by any means. You can also opt to buy a small portable battery just to jump start the car. They’re not exactly chump change at around 60 to 120 dollars, but if your peace of mind is worth that much it’s a good investment. Yep, that’s right. Just a good old bag of sand to help with traction. Cat litter may also suffice, so long as it’s the non-clumping kind. If you already have a cat and don’t mind storing their spare litter in the car, this may already be something you have. These are a start, but definitely not all you can do. The biggest thing that you have when your car breaks down is still your car — you should have it serviced regularly to ensure that the chances of being in this situation are minimized, and that if it does happen, you can use your car as shelter. Cracked windshields and leaks will mean your car isn’t a safe space to stay in when the cold hits. For all your car repair needs, King Brothers Collision can help. Our highly-skilled auto mechanics will be more than happy to give your car a full run-through. Give us a call at 313-534-8090 (Redford) or 734-744-8557 (Livonia), or feel free to request for a quote here.